The number of people falling ill with the vomiting bug norovirus in England this winter is at higher than average levels, figures suggest. Lab testing has revealed there have been 1,704 cases so far – 9% higher than the average seen at this stage in the previous five winters. This will be a fraction of the total number because it only captures people seeking NHS help. In hospitals, there have been 100 outbreaks of the bug. These outbreaks cause hospitals to close down beds and whole wards at what is the busiest time of the year. According to latest figures, over 850 beds are closed because of norovirus out of a total of 100,000. 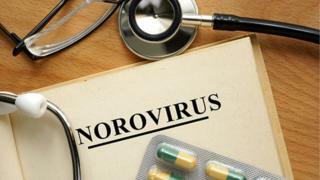 But Public Health England warned people not to be alarmed, saying the levels being seen were still within an expected range and it may just be a sign that norovirus is peaking earlier this year than previous ones. Nick Phin, of PHE, said continued outbreaks should be expected. “Norovirus is a common cause of illness during winter. Meanwhile, NHS England has released it first winter statistics of the year. The figures, which cover the first four days of December, showed eight hospitals declared a major alert – or what used to be known as red and black alerts. This happens when hospitals have bed shortages, ambulances queuing outside and patients waiting longer inside A&E. To cope, hospitals have to start calling in extra staff, cancelling routine treatments, such as knee and hip operations, and diverting ambulances away from their hospital. The ultimate step is a full closure of A&E, although none of them took this step. It comes after the BBC revealed this week the number of so-called “trolley waits” – the long delays patients experience waiting for a bed after emergency admission – had risen five-fold over the past five years. Currently more than one in 10 patients face a wait of over four hours. John Abercrombie, of the Royal College of Surgeons, said it looked like it would be a “bleak winter” for the health service.